I’ve been lost in the archives, and finally found my way out! I’ve actually been taking some time to look at the collection as a whole, and have been eager to get back into looking at some of the contents at a closer level. One piece which caught my attention early on was a letter from none other than Robert F. Kennedy, from 1957. I’ve been excited to dig into this and learn more about the people in the letter and circumstances surrounding it. Robert F. Kennedy, before his career in the senate began in 1961, was a lawyer and served on the Senate Select Committee to Investigate Improper Activities in Labor and Management, also known as the Senate Labor Rackets Committee. Bobby Kennedy, contrary to how he seems to be popularly remembered, was remembered by Gettler to have “spent no time on any niceties and was cold as ice.” (p. 108) Perhaps Kennedy’s demeanor had more to do with his pronounced hatred of Jimmy Hoffa and determination to take him down. Contrary to Kennedy’s status as a member of America’s “Royal Family,” Jimmy Hoffa worked his way up from poverty as the son of a coal miner. He grew up poor in Detroit where toughness was a survival skill, and began his involvement in labor unions in the 1930s. While Gettler, along with much (if not most) of America, and even Kennedy, supported labor unions, Hoffa’s tough guy approach was problematic. People were murdered, including a supposed attempt at Gettler himself, as a gunshot through Gettler’s office window, barely missing his head. It was known incidents like this that made the testimony of James Luken, then head of the Milk Driver’s Union, which was part of the Teamsters, notably brave. 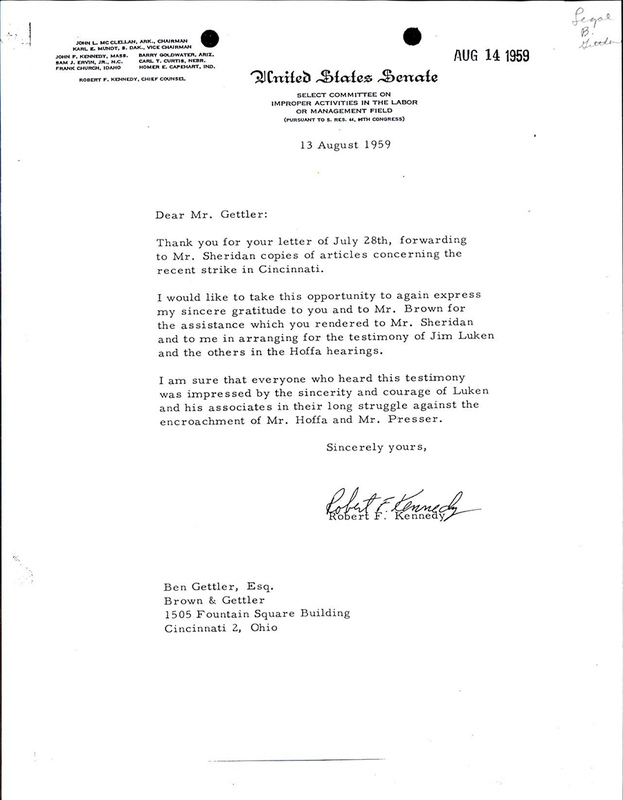 Threats and violence were meant to deter people from working against Hoffa, and James Luken decided to boldly testify against Hoffa, with Gettler as his attorney. Together, they met with Kennedy and his team at the Brown and Gettler office in Cincinnati, and testified before the Senate Committee in Washington D.C. If Luken’s name sounds familiar, it may be because like his brother Tom and Nephew Charlie, James served as mayor of Cincinnati. Coincidentally, there is also a significant amount of correspondence and other content within the Gettler Papers regarding Tom and Charlie Luken. The Mr. Sheridan mentioned in the letter was Walter Sheridan, who served as the investigative chief of Robert Kennedy’s investigative team, known as the “Get Hoffa Squad.” Gettler, who represented labor unions as a lawyer, forwarded articles concerning a labor strike in Cincinnati. As evidenced by the large collection of correspondence to politicians in D.C., this was a favorite method of Gettler to not only keep in touch, but also to inform people in office of what was happening and being discussed locally. I found it quite fascinating that Cincinnati had such a contribution to the Hoffa investigation, more so that it involved a future Cincinnati mayor, who was represented by our very own Benjamin Gettler. Gettler, B. (2012). Visible Footprints: The Life of Benjamin Gettler. Cincinnati, OH: Cincinnati Book Publishers.